Forty-four years ago, on Feb. 19, 1975, the Supreme Court ruled that an employee has the right to request union representation in any meeting that she or he feels could result in discipline or termination. You Are Being Asked Questions That Might Lead To Disciplinary Action: What Do You Do? If you believe that discipline will result from a meeting with management/administration (in legalese, “an investigatory interview”), you can insist that a union representative be present during this interview. This is part of your “Weingarten Rights,” which references the 1975 United States Supreme Court case NLRB vs. Weingarten. 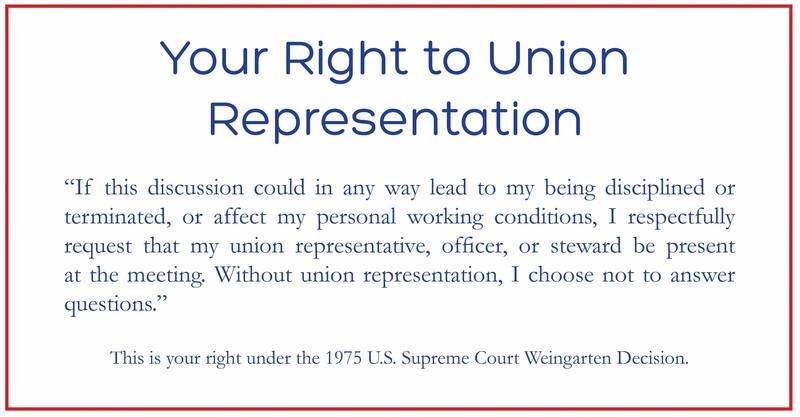 Weingarten Rights apply only to members of a collective bargaining unit and are among the many benefits of having a union. Rule 3) – If the interviewer denies your request and continues to ask questions, this is an unfair labor practice. You have the right not to answer any questions until you have union representation. You cannot be disciplined for refusing to answer the questions, but you are required to sit there until the supervisor terminates the interview. Leaving before this happens may constitute punishable insubordination in some cases. The AAUP-UC represents all members of the bargaining unit, both those who pay dues and those who do not, and is obligated to come to your aid without prejudice. If you are summoned to a meeting with a member of administration and discover that it is an “investigatory interview,” assert your right to have a union representative present. No day in the calendar is a greater fixture, one which is more truly regarded as a real holiday, or one which is so surely destined to endure for all time, than the first Monday in September of each recurring year, Labor Day. With time, this day of the year is taking deeper hold in the respect and confidence of the people. It is regarded as the day for which the toilers in past centuries looked forward, when their rights and their wrongs might be discussed, placed upon a higher plane of thought and feeling; that the workers of our day may not only lay down their tools of labor for a holiday, but upon which they may touch shoulders in marching phalanx and feel the stronger for it; meet at their parks, groves and grounds, and by appropriate speech, counsel with, and pledge to, each other that the coming year shall witness greater efforts than the preceding in the grand struggle to make mankind free, true and noble. – Samuel Gompers, President of the American Federation of Labor. Your Weingarten Rights Turned 43 Today! Forty-three years ago, on Feb. 19, 1975, the Supreme Court ruled that an employee has the right to request union representation in any meeting that she or he feels could result in discipline or termination. Labor Day is the day conceded by no one class or set of people to another: it is the day of the workers, secured by the workers for the workers, and for all. Published in the New York Times September 4, 1910. Long Island University Brooklyn recently locked out the faculty in the middle of contract negotiations. This union busting attempt to starve the LIU Brooklyn faculty into submission is deplorable and the labor movement stands in full solidarity with the Long Island University Faculty Federation (LIUFF). The AAUP-UC has sent a letter to LIU Brooklyn’s president urging the administration to end the lockout and engage in good faith bargaining immediately. We’ve also been in touch with the LIUFF. The faculty are holding strong and have no intention of submitting to the administration’s disgraceful tactics. If you want to support the faculty at LIU Brooklyn, you can take a moment and fill out the petition located here. You can also follow what is happening with the lockout at the LIUFF website and the LIUFF Twitter account @LIU_FF. Several stories have also been written about the lockout including Lockout Lessons and Locked Out On Labor Day. At a time when academic freedom and integrity is under assault at institutions of higher learning across the country, it’s important that we stand united with the members of the LIUFF as they fight for a fair and equitable contract.